Hi friends! I hope you are all doing well. We are ok. We are getting over a cold. I got a sinus infection from the cold and ended up on 7 days of antibiotics. Sigh... let's hope that this isn't a trend this cold and flu season. We did go get flu shots as a family so maybe that will help. A little while ago, I posted about the 30 invitation I made for a friend's baby shower. I also said that it was not the original design. This card was the original design, made the match the baby's bedding. This is MUCH simpler than the design I ended up going with. The star paper has the faux ribbon and the striped at the bottom. Also, there's less paper piecing. 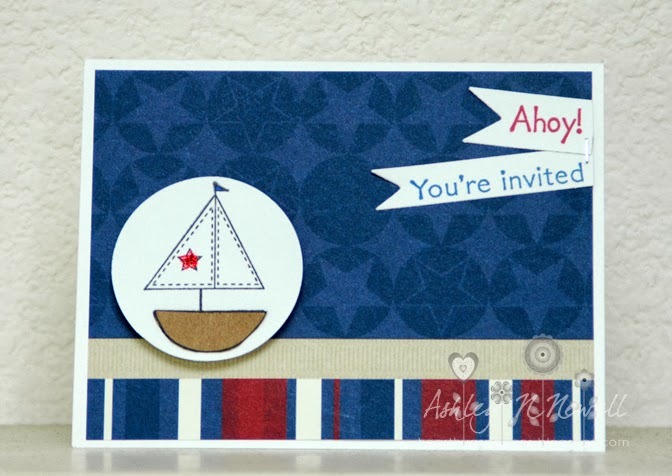 The paper is from Joann Fabrics, the boat and ahoy sentiment are from an old Gina K set, the You're Invited is from Stampin Up.